In the sweet science of boxing, fighters are segregated in groups by weight class. This distinction makes sense to keep the fights interesting and more importantly fair. Often time however, the most interesting match-ups happen whenever somebody shifts down or up a weight class to compete in a group they were not primarily groomed in. Understandably, time, techniques and styles change which make such contests even more exciting because a change of weight class means the very identity and context of the fighter is being redefined at those few minutes in the ring. When it comes to processors, shifts in market segment approach happens to a product line rarely but when it does happen, all are watching because of how integral a processor is in a system build. 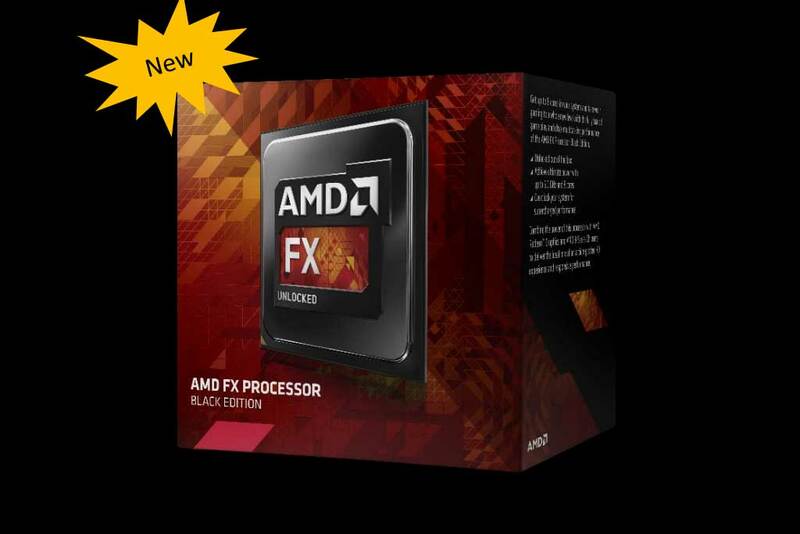 Like a seasoned boxing trainer shifting former heavy weight fighters to a lighter weight class, AMD is introducing three new additions to their FX line to fill-in the void in the ranks between and around their current crop. 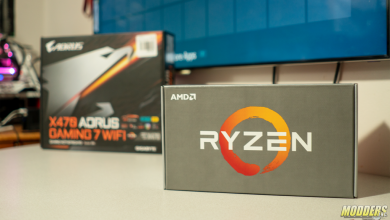 The roster needs filling after a shake-up caused by the former heavyweight FX-8350 dethroned down to light heavyweight by the absurdly imposing 5GHz FX-9590 and all light heavyweight segments left wide open as the mainstream segment FM2 APUs, Quad-core AM3+ and featherweight AM1 processors cannot move that far up the weight class. 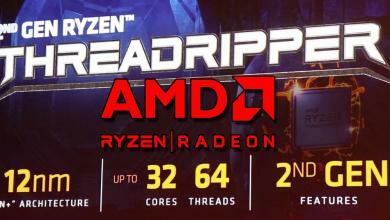 Intel’s top-end mainstream Core i7’s have also been throwing out haymakers that have been unanswered for a few years now so AMD’s focus is on their rival’s latest i5 and i3 offerings instead while leaving the heavier challengers to the FX-9590. The increased FX product line is coupled by a massive shift down in price like a boxer shedding weight. The FX-8350 which used to be AMD’s Intel Core-i7 contender now priced to target i5-4430 with a $10 advantage. Taking up its mantle as the most powerful of the FX-8000 lineup is the new FX-8370 which enjoys a slight max Turbo bump to 4.3GHz compared to the FX-8350’s 4.2 for $20 more than the FX-8350. 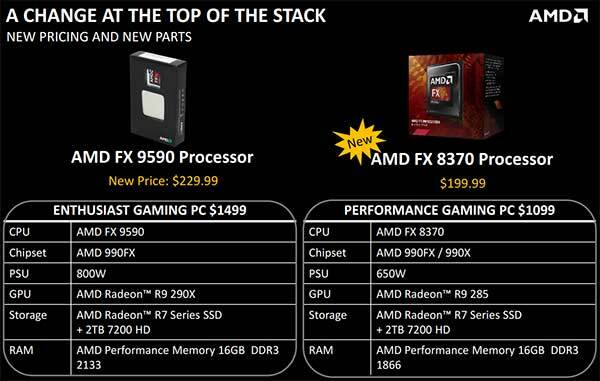 Two new E-series FX processors with a more conservative 95W TDP (similar to the FX-6300 and FX-4300) have also been added priced $199.99 and $146.99 respectively as a thoughtful upgrade option for those armed with AM3+ motherboards that do not have enthusiast-class VRM (often exclusively on 990FX chipset motherboards) that can handle overclocking 125W TDP processors. 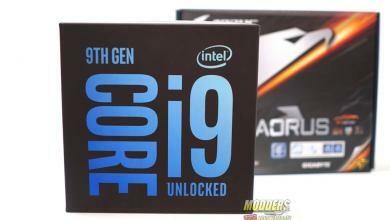 With AM3+ 970 motherboard prices starting at $55 at NewEgg.com, these new processors make excellent budget build bases. 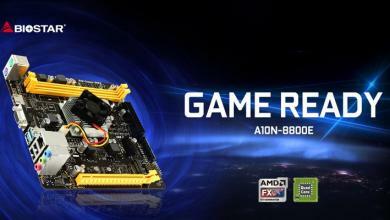 In tandem with the addition of three new FX processors, AMD is also launching the new Radeon R9 285 as a more sensible option vs aging NVIDIA’s GTX 770 to round-up the FX platform system build option. Before we recap the FX processor and 9-series lineup, let us briefly take a look at the price history of AMD’s FX series as it is certainly one of the most interesting price down shifts in recent memory.